An image by Fred Espenak (http://www.mreclipse.com/) of a total lunar eclipse in 2004.
and the eclipse does not become endless night. 1. When will eclipse happen ? This is the fourth eclipse of a series called "tetrad" in the interval 2014-2015 and will "officially" occur on September 28th 2015. It is a fully total eclipse and you should consult question 3 to know the eclipse time for your place. 2. Where can it be seen? The following map (according to ref. 1) shows world regions where the eclipse will be visible (white areas correspond to full visibility) from P4 to P1. In Brazil, the entire eclipse will be visible. The same is valid for West Europe and East United States. The difference, however, is that, while in Europe the moon will be setting and eclipsed, in East USA the moon will be rising. The eclipse will not be visible from the Far East, including China and Australia. 3. At which time will the eclipse occur ? Eclipse time depends on observation place. Eclipse begin and end phases may fall on different dates depending on the observation site, that is, if the eclipse interval includes the change of date. The following figure (also according to 1) is the moon position map referenced to the Earth shadow. The eclipse runs from P1 to P4. The Earth shadow center (umbra) contains the ecliptic. The Earth "semi"shadow or penumbra is larger than the umbra and sets the limit for phenomenon begin and end. It starts at P1, the moment when the moon "touches" the penumbra. At U1, the moon enters the umbra and is completely eclipsed at U2. The point of maximum umbra penetration is the greatest eclipse. 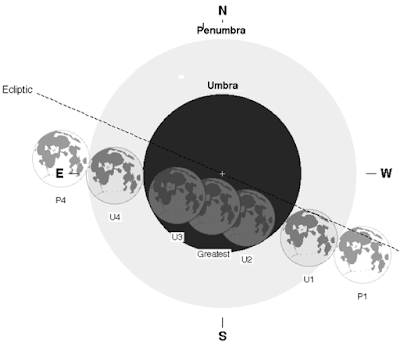 Moon starts to leave the umbra at U2 and the phenomenon is finnished by the time the moon reaches P4. For example, in Brazil, the total lunar eclipse will start on September 27 (Sunday) at 21:11 or 9:11 PM (Brasilia time = UT - 3:00) and finnish at 2:22 or 2:22 AM on Semptember 28 (Monday). For the (continental) USA, the eclipse will be seen with the moon rising in the first hours of the night on September 27 (sunday). 4. How long will the phenomenon last ? The "umbral" phase or totality will last about 3 hours ad 20 minutes, while the entire event will take 5 hours and 10 minutes considering the penumbra entrance and egress. 5. What are the main features of this event? This the 137th eclipse of the Saro's series that started on December 17th 1564. At the eclipse greatest phase, the moon will be at 00h17' 33'' in right ascension and +1deg, 32' 3" in declination, that is at Piscis-Cetus border. The estimated umbra magnitude is about +1.2. There will be few bright stars close to the moon, however, several ones will be occulted. Consult a good sky simulator for your place for the star occultations during the event. Important: at 1:47 UT the moon reaches perigee (356876 km from Earth). Therefore, during the eclipse we will also witness a "super moon" event (3), a rare combination. 6. What is the best equipment to observe the eclipse ? Binoculars (7X50 or 10X60) are definitely the best equipmet to use during moon eclipses. Since the moon can be very high in the sky, a comfortable chair is recommended. 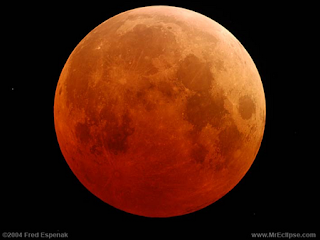 Telescopes can also be used provided low magnifications are employed so that the entire moon disk is visible at the eyepiece during all event phases. Naked eye observation allows to appreciate the deep brightness change between the full moon and totality. 7. How can one photograph the phenomenon ? You can use a digital came with a tripod and several exposure settings (manual) during all phases. During totality, exposure times of several seconds may be required depending on the ISO and f/D numbers. A practical guide to photograph eclipses can be found in (2). 8.Will be moon turn red ? Yes it will. Moon disk reddening is one of the most amazing effects during totality and can always be seen, although changes in the umbra brightness contributed to enhance or lessen the moon aspect. The reddening is due to the dust in suspension in the Earth atmosphere which refracts sun rays totalty occulted to the moon. 9. Must I go to a dark place to see the eclipse ? Not necessarily. The moon is a bright object in the sky so that its observation is possible even under the brightest city skies. However, in order to fully appreciate the contrast change in the sky between totality and full moon, a dark site is a better place to go. 10. When next great lunar eclipse will be ? As fully visible in the Americas, the next eclipse will be on January 21th 2019. Therefore, you should better enjoy this September great event! 2. F. Espenak (2008). How to Photograph a Lunar Eclipse. 3. See: Lunar Perigee and Apogee Calculator.